Successful deployment of IPTV servicesrequires performance parameters to be monitored at a number of different pointsin the complete end to end chain, including the customer premises, keyaggregation points and at interconnect points between disparate and serviceprovider network domains. This Recommendation defines five monitoring pointswhere such performance measurements can be made. 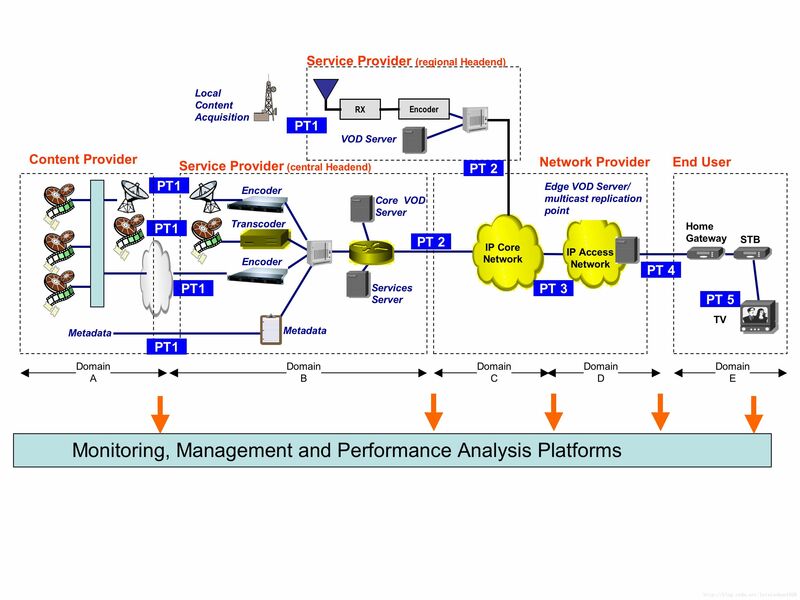 ThisRecommendation defines performance monitoring points which will allow theservice provider/network operator to monitor the performance of the completeIPTV service delivery to the end-user. · Ensuring that systemperformance does not degrade with time. The goal of performance monitoring is toprovide end-users of IPTV services with a high user experience by identifying,localizing and quantifying service and network issues. Thefollowing ITU-T Recommendations and other references contain provisions, which,through reference in this text, constitute provisions of this Recommendation.At the time of publication, the editions indicated were valid. AllRecommendations and other references are subject to revision; users of this Recommendationare therefore encouraged to investigate the possibility of applying the mostrecent edition of the Recommendations and other references listed below. A listof the currently valid ITU-T Recommendations is regularly published. Thereference to a document within this Recommendation does not give it, as astand-alone document, the status of a Recommendation. [ITU-T Y.1540] ITU-TRecommendation Y.1540 (2007), “Internet protocol data communication service –IP packet transfer and availability performance parameters,” Nov. 2007. [ITU-T Y.1543] ITU-T Recommendation Y.1543 (2007), “Measurements in IPnetworks for inter-domain performance assessment,” Nov. 2007. [ITU-T Y.1544] ITU-T Recommendation Y.1544 (2008), “Multicast IPperformance parameters,” . Platform Ahardware and/or software architecture that serves as a foundation or base forrealising a certain functionality. The keyword “is recommended” indicates a requirement which isrecommended but which is not absolutely required. Thus this requirement need not be present toclaim conformance. The keyword “may” indicates a requirement which is optional. The entire IPTV content delivery chain can be divided into multiple domains. Operators at domain bordershave the option to perform monitoring which, when taken together, forms anend-to-end monitoring topology. This domain approach is independent of any specific monitoringmethod. Monitored performance characteristics, across a single domain ormultiple domains, can be integrated with existing or new operations supportsystems (OSS)and/or network management system (NMS) systems. The exact topology and domains will varyfrom one operator to another; however, monitoring can be applied at each domainboundary. An example topology with generalized domain boundaries is shown inFigure 1. These domains are further divided into specific monitoring domains inFigure 2. Within each domain, different aspects can be monitored at each domainboundary as outlined below. A complete performance monitoring system is recommended to include aperformance monitoring management platform to translate the measured data fromthe monitoring points into actionable knowledge. Functions of the managementplatform could include data storage, analysis, correlation, faultidentification, root cause analysis, report generation and visualization. Therange of the management platform(s) may cover all domains as shown in Figure 2. The interfaces between the performance monitoring managementplatform(s) and the monitoring points will be further defined in the future. This section provides a basic description of each monitoring point shown inthe previous section. The capabilities and parameters listed below are not anexhaustive list. Some parameters may be difficult to obtain in some scenarios.Conversely, there may be some other parameters that are essential. These arestill under study. This point demarcates the domain borderbetween content provision and IPTV control. PT1 is located at the domain border between content providers (contentowners and aggregators) and IPTV Service provider. PT1 enablesthe measurement of source audio-visual quality and metadata verification and theanalysis of information to be exchanged between content provider and IPTV serviceprovider. · Report testing information for quality parameters ofvideo audio and text content from various content providers to the service quality monitoring platform. This point is located at the domain borderbetween the service provider and network provider. It should aim for originalstreaming quality monitoring. PT2 monitors the service provider streamquality at the head-end egress. · Report information for quality parameters ofvideo, audio and text content and performance parameters of servers to the service quality monitoring platform. This point is located at the boundarybetween the IP core and IP edge networks for monitoring of IP-relatedperformance parameters.This point can be placed on any type of interfacebetween the IPTV core network and the edge network. · IP network performance as definedin (ITU-T Y.1540]. Recommended methods of measurement are found in [ITU-T Y.1543]. · Multicast IP networkperformance parameters defined in [ITU-T Y.1544]. · Able to capture information onquality originating from end-user devices. This point is closest to the user wheremonitoring the quality of streaming, audio-visual quality, and IPTV serviceattributes areimportant. Monitoring at this point can be implemented byintroducing the performance monitoring function in Home Gateways and STBs, forexample. · IP network performance parametersdefined in [ITU-T Y.1540]. Recommended methods of measurement are found in [ITU-TY.1543]. · Multicast IP network performanceparameters defined in [ITU-T Y.1544]. · Report information for parameters of IP network performance, servicequality that access IPTV service platform from edge point, and stream mediaquality to service quality monitoring platform. This point is at the final end-point anddirectly relates to end-user QoE. Monitoring audio-visual quality, textaccuracy and IPTV service attributes as perceived by the end-user areimportant. · Report information for parameters of IP network performance, servicequality that access IPTV service platform from client, and stream media qualityto service quality monitoring platform. Security aspects have not been addressed inthis Recommendation.